Scholarship on The Smoketree School made big strides in the spring of 2011 with the release of three new books covering unexplored corners of desert art. California Light: A Century of Landscapes is the long-anticipated history of the California Art Club, the venerable group that has fostered so many artists over the years. The release coincides with the hundred-year anniversary of the club. The text is by Molly Siple and Jean Stern, executive director of the Irvine Museum, with a chronology provided by club historian Eric Merrell, a dedicated painter of deserts—among other subjects—and known for his recent exhibits of Salton Sea and Joshua Tree art. 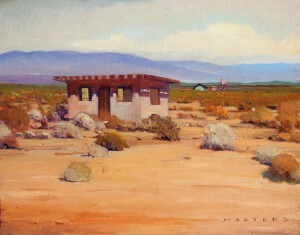 The section devoted to Desertscapes includes a painting of a Wonder Valley homestead by Palm Springs’ own Terry Masters. 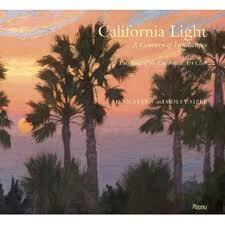 California Light is especially heartening when it comes to the future of landscape painting in the state. Many contemporary painters of light and landscape are introduced. We invite them all to test their skills on the disappearing dunes and increasingly elusive patches of purple verbena. If you’ve seen the Stephen B. 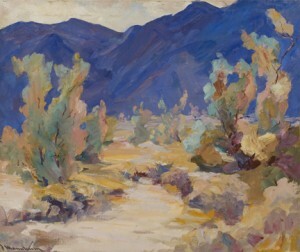 Chase Collection of landscape paintings at the Living Desert, you’re probably familiar with the name Jean Mannheim. The German-born painter was among the earliest wave of artists to paint the desert—visiting as early as 1919—and was a friend of painters Benjamin Brown and William Wendt, the so-called dean of Southern California landscape artists. 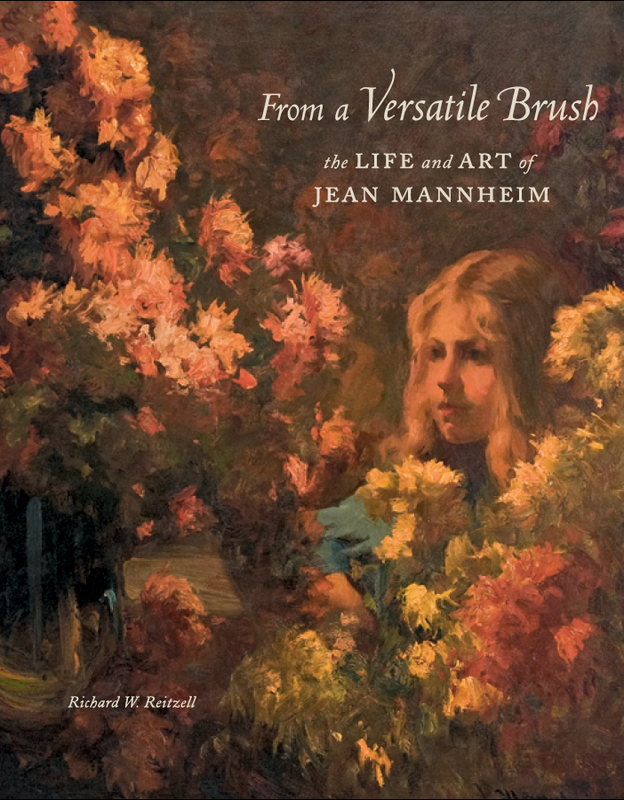 Mannheim’s story has been little-known, but–thanks to the painter’s great- grandson, Richard Reitzell—we now have a vivid collection of Mannheim’s work: From a Versatile Brush: The Life and Art of Jean Mannheim. Mannheim was active in the early years of the California Art Club, so the book intersects thematically with the previously mentioned California Light. On a recent golf getaway to Palm Springs, Richard Reitzell stopped by the Palm Springs Museum café to talk about his book. An executive for a pharmaceutical company and an enthusiastic explorer of California art, he previously edited a book on the art of the Jonathan Club, the elite 100-year-old social club in downtown LA. When Reitzell’s father died five years ago he inherited a trunk full of Mannheim’s letters and exhibition catalogues. That set him on journey to scour archives and find out everything he could about his great-grandfather. The painter lived in the Arroyo Seco neighborhood of Pasadena, one of two major colonies that incubated desert artists, the other being Artists’ Alley in Alhambra. With an introduction by Jean Stern, the book includes an entire chapter on Mannheim’s desert work. “We know he had at least three good friends who had ranches in the area,” says Reitzell. 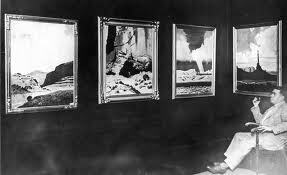 On his frequent visits, Mannheim painted classic desert subjects—Point Happy, Box Canyon, the Santa Rosas, the Salton Sea and (again and again) Mount San Jacinto. 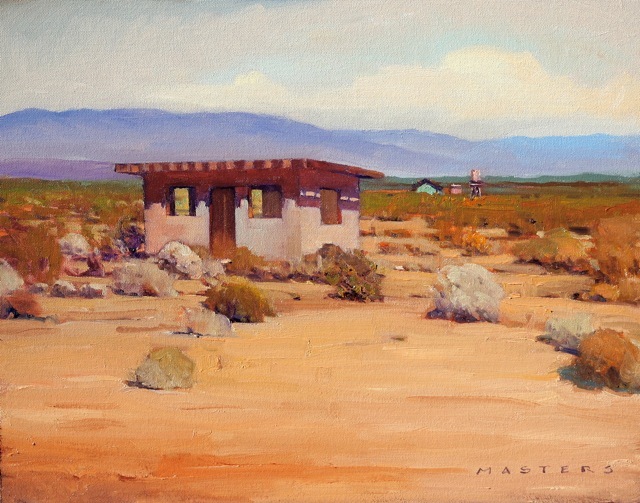 His desert painting “Magic Moment” was selected by Gardena High School’s senior class for their 1923 gift to the school. The Gardena Collection is an important cache of early California art and was featured in a 1999 exhibition called Painted Light. Mannheim’s strongest work—including many portraits—was done in the teens, Reitzell says. As he grew into his 70s, he spent more and more time in the Coachella Valley, relying on friends for rides. (Like desert painter Agnes Pelton, he didn’t drive.) Mannheim was one of the most respected artists of his day; but after he died in 1945 he was somewhat overlooked. With this book, Reitzell hopes to again remind the public of Mannheim’s scope. 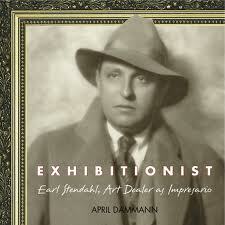 The final book in the trio, Exhibitionist: Earl Stendahl, Art Dealer as Impresario, explores the life of LA’s premier art dealer, also a friend to desert artists including Edgar Payne, Alson Clark, Nicolai Fechin, Guy Rose, Jack Wilkinson Smith and Maynard Dixon. Author April Dammann is married to Stendahl’s grandson, Ronald Dammann. Jimmy Swinnerton at the Stendahl Gallery, 1927. Courtesy of Blue Coyote Gallery. Stendahl began dealing in paintings in 1911. He has been called the most important art dealer in California and one of the most influential in the world. What he liked mattered in the art universe, and one thing he liked was the desert and its artists. Dammann said via e-mail that Earl Stendahl and his wife Enid spent springtimes in Palm Springs throughout the 1950s, renting the well-known Cary Grant house, a 1920s Mediterranean in the Movie Colony. The men in the extended family came down for the weekends and the kids were enrolled for the spring semester in Palm Springs schools. Undoubtedly, the art dealer invited artists he represented to visit. And what would they do here but paint? Opening his gallery first in the Ambassador Hotel and then in a larger space on Wilshire Blvd. , Stendahl sold to distinguished collectors and institutions including William Randolph Hearst, Frank Lloyd Wright, George Gershwin, Vincent Price, Edward G. Robinson and even the Louvre. The gallery, still in operation in a different location, celebrates its 100th anniversary this year. there are many “lost” or unknown artist that painted in the valley. Freda Marshall moved with her husband to the valley in 1922 and stayed and painted her whole life. her early impressions seem effortless and quite peaceful. She moved into more modern styles after the war. She and her husband stayed at the Cochran Ranch in Indio and the the rich and famous, including Eisenhower, visited often. George Marshall supervised and built the ranch until he died in 1943 leaving Freda to provide for her children. Freda created some bas reliefs and painted. The bas reliefs were the centerpice of the Cochran Ranch’s main room and they were the iconic pieces when the ranch became the Indio Valley Country Club. I have been researching her and from what I can gather she was quite productive, but there was no one to promote her after she died in 1960. Slowly regional art historians are finding other forgotten artists, many quite talented and influential on other artists, having paintings in homes and collections all over the valley and in some cases, in the homes of the influential and connectd. With no one to promote them, their single paintings have a hard time reviving interest in the artist when there is no collection, or center, or attachment to someone, or to a school. But many were important. Freda herself was one of the early valley resident painters and spent 4 decades as a valley painter at the same time as being a wife, mother, provider. Anyone with information about Freda please contact me at Paulse@sbcglobal.net.